These arthropods are also called sow bugs, wood louses and roly polies, and live on the ground in moist places. This guide is about getting rid of pill bugs. In our garden, we have a huge infestation of pill bugs. In fact, it is so bad that if you stick a small shovel in and pull out a little bit of dirt, you uncover about 20 ants, 40 -50 pillbugs, and 1 or 2 worms. I know the worms are good, but I'm worried about the pill bugs. Does anyone have a cure? Oh, I've heard about how you could grind the pill bug bodies and mix with water to make an insecticide, is that true? I don't think those bugs do much harm. I think they eat some plants but on a pretty small scale, even when there are lots. You could put some mulch down and they likely would eat that instead. If you are having a problem with plants being eaten, set up a slug trap nearby and see if you capture any slimy slugs or snails. A plastic container with some beer in it works. diatomaceous earth is recommended as a deterrent. Apparently pillbugs vary from region to region. Here in north Texas, they most definitely do a lot of harm, burrowing down into the roots of young plants and literally eating them away till the plant dies. I bought a couple new plants at Lowe's which apparently were already infested with pillbugs (or eggs), and within 4 weeks they infested my whole garden. 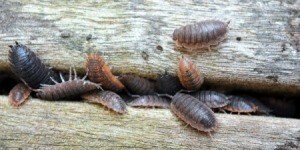 When I uprooted some dead plants to return, they each had 50 - 60 pillbugs clinging to their roots, still munching away! Grr. I don't use poisons since I grow herbs and vegetables mixed in with my flowers and other plants. Shaved cedar didn't seem to bother them, and neither did any of the other organic repellents I tried. My "solution" (for what it's worth) was to finally give it up, pull out my husband's shop-vac, and simply vacuum them up daily for a couple weeks, lifting up planters and rocks, pulling back foliage, etc., to leave no pockets for them. They reproduce at a mad pace! By the end of the first week their numbers were greatly reduced, and after two weeks there were only a few here 'n there. The way I lowed my pill bug population was by trapping them, I used yogurt containers, use a hole punch and punch several holes in the side rim of the top, put about an inch of soapy water in the cup, bury the yogurt container level with the ground, place a board on top with a slight gap, you need to check this daily because it will fill up very fast. On several occasions I have had annuals virtually wiped out in a day or two by pillbugs. They love zinnias and petunias -- even marigolds. It took me a long time to figure out that pillbugs were the culprit, but now there is no doubt. Because I am reluctant to use insecticides, I have been going out several times a day and squashing them by hand. (small garden) This seems to help, but I want to try diatomaceous earth as well. Thanks for the suggestion. I found this article in the internet, I have not tried it as of yet, but I am looking forward, especially to the spider. AKA: Doodlebugs, woodlice, woodlouse, rolypolys. Small terrestrial isopods having a convex segmented body that rolls up into a ball. Pill bugs are actually relatives of shrimp. Pill bugs and sow bugs are different. Both pill bugs and sow bugs will inhabit the same area. They are difficult to tell apart. How can you tell? The pill bug can roll into a tight round ball and the sow bug can sort of "hump" up. 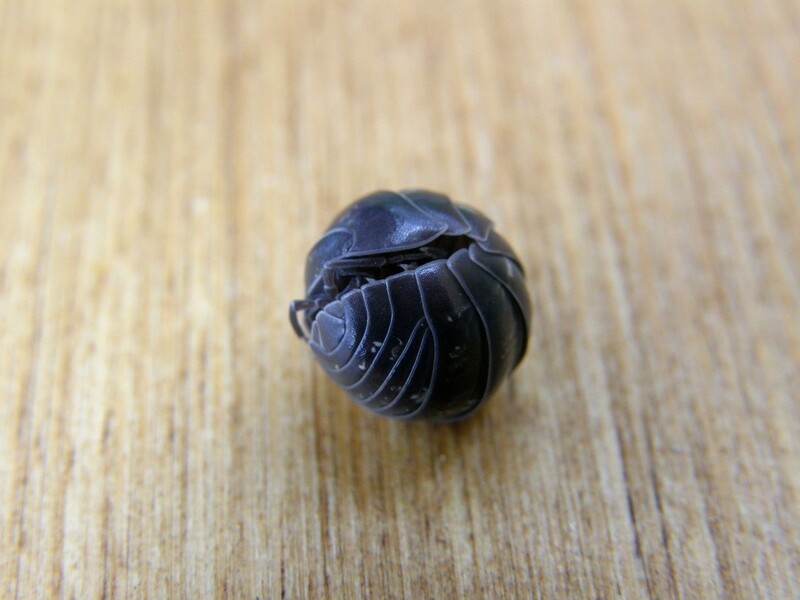 It cannot form a "pill" like the pill bug can. Both bear young twice a year or more. They carry them until the young are able to keep up with the rest of the colony. The young may leave mother at times however it is not unusual for them to come back, allowing her to to take care of them for as long as she can. As food supplies dwindle, colonies will relocate and forage to nearby areas that fill their dietary needs. Most feeding is done during the night. Sow bugs also have gills and need constant moisture to live. They tend to live in moister northwest climates. They are primarily nocturnal, and eat decaying leaf litter and vegetable matter. They sometimes feed on the tips of young plants, but they also help the environment by breaking up decaying plant matter and help speed up the recycling of the nutrients they contain. * Use corncobs as a bait to trap these intruders. * Remove their hiding places such as piles of plant material, boards/wood, bricks, large rocks, etc. * Reduce moisture or humidity level indoors. Use bathroom fans, stove hood vent fans, vent clothes dryers outside. * Crawl spaces and attics need to be well ventilated. Remove excess vegetation and debris around exterior perimeter of the home. Make sure that leaf debris (leaves hold moisture and hide the bugs) is cleaned up from around the outside of your house. * Keep rain gutters and downspouts clean and in good repair. Instead of chemicals, use a caulking gun to close any cracks or crevices at or near ground level. * Houses built on a concrete slab poured directly on the ground, can have more of a problem with sow bugs or pill bugs if there is no moisture barrier under the concrete. * Built-in planters are usually a bad idea for many reasons. Window box planters and planter boxes on decks tight against the house are good breeding places for many bugs. * There is a spider about one-half inch long with a brown rear body and a reddish front body. It has prominent fangs, long front legs, and is timid as it usually runs for cover when disturbed or seen. It doesn't have a common name but they are everywhere and harmless to people. The scientific name is Dysdera crocata. This little fellow feeds almost exclusively on pill bugs. They live under objects on the ground like stones etc. where pill bugs live. The long fangs" are used for feeding on the pill bugs not you! Pill bugs, they are easy to catch. The tools you will need: stick, bin(or a cup) it is real easy. Just look under rocks or damp logs. Now poke them with your stick(not hard).They will go into thier ball. Then just pick them upand set them in the container. Pill bugs (or roly poly's as I have always called them) feed primarily on decaying matter. I have observed them in my garden for long periods of time, and done a little research, just to figure out what they are doing (I obviously have no life (but am afterall, a geeky scientist)). In my garden, they are certainly prolific, but appear to chow down on the remnants of my compost pile that hadn't completely broken down. These observations have put my mind at rest, and confirmed that these crustaceans are actually beneficial to the health of my garden. However, I might also point out that my small garden consists only of peppers, corn, cucumbers, tomatoes, and lettuce--that is to say, they may have an appetite for other plant varieties and thus could potentially wipe out a garden of other plant species (although I think this is rare and unlikely). Most crustaceans in this world (be them terrestrial or aquatic) are primarily scavengers--they are the "garbage men" of the microcosmic insect world. They eat fungus, molds, and other dead things and play a beneficial role in the cycle of nutrients. If you have vegetative plants that are dying, it is likely the cause of some other perpetrator--likely one that you cannot see with the bare eye. Roly-poly's in your garden, in my opinion, are a sign of a healthy nutrient exchange. Look in to other likely pests such as aphids, parasites, or even vegetative diseases. These little buggers may eat live plants on a small scale -- but my whole garden is small scale. I plant one tomato plant, and last year I had to collar my third attempt with a plastic cup to keep the isopods from munching its juicy little stem. Of course, it got such a late start by then that it only produced flowers before frost, no fruit. I will try the yogurt container trap. I did have a little luck sprinkling corn meal in the garden with it killing both isopods and millipedes, but it only worked once. Once my plants are established, I don't think they'll cause much trouble. Its just a matter of keeping the population low in the spring and early summer. How do I get rid of Pill bugs in my house? Can you just collect them by hand and put them out behind the garage? Pesticides are poison and should only be used as the very last resort. Try googling "pill bug" (with quotes) and "natural control" and see what you get. We live in Missouri and found that hiding "hedge apples" around in the house gets rid of pill bugs & keeps them away.